I look forward to Cigar Aficionado's top 25 list every year. It's no secret that I love anything Don Pepin blends. So, this year, I was happy as a clam to see their family garnered numero uno for 2012. I smoked one of these during the summer, and while I didn't review it, I did recall it being a terrific cigar. The Wharf got them in at the end of January and they went through two boxes in 8 hours! They re-ordered 12 boxes and they are, at the time of this writing, down to a box and a half remaining. If that is any indication as to the quality of the Flor de las Antillas, it would appear that we have a cigar here that truly deserves the mantle of number one. I have smoked a few of them before this review as well and...well....let''s just see how it is, shall we? Construction: Like most of the Garcia family cigars, the Antillas is rustic in appearance. Expertly rolled and elegantly presented with a gorgeous band and ribboned foot, this toro really harkens back to the good old days of Cuban cigars being sold in saloons to the likes of Wyatt Earp and Bat Masterson. Pre-light Aroma and Draw: Out of the cellophane, the Antillas lets off a rich and spicy tobacco aroma with a core of earth. The draw, as you would expect from something made in the My Father factory, is so open it could be used as a straw. Light and Burn: Lighting up with two matches is a cinch and the burn quickly develops into a picture perfect line. The ash is slightly flaky light gray and clings to the cigar well. 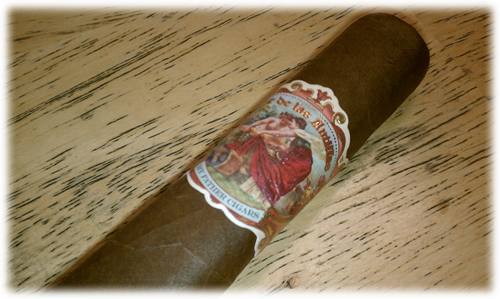 Tasting: Okay, first I think I better tell you how this cigar differs from most of Don Pepin's creations. First of all, this is a much milder cigar than the usual Don Pepin creation. Well, mild is a subjective term. It's certainly a touch above medium body. The start of the cigar lacks the usual blast that Pepin is known for as well. Alrighty then, now let's taste this thing. The cigar is loaded with a dense leathery and earthy core that is laced with other flavors as the cigar burns down. I pick up nuts, coffee, and loads of oak in the first third. The finish is bright and clean making the mouth water. Into the second third the core of the cigar maintains that earthy leathery flavor and adds some cedary spice with a hint of chocolate. There is also an unusual toasty flavor that reminds me of paprika. As the Antillas closes the spice picks up a bit but still shy of the Pepin powerhouse staple. Overall a truly excellent cigar. Value: Here is the true quality of this cigar. $8 each at a brick and mortar. That is about half as much as last year's number one. Final Thoughts: One of my pals, Jimmy, smoked one yesterday and exclaimed, " this is delicious" ...and then he bought two more. If you know Jimmy, you know that is high praise. I enjoyed this cigar immensely and look forward to more in the near future. 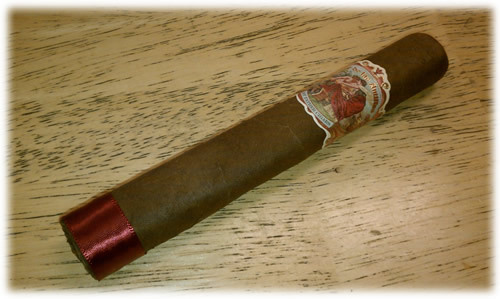 Unlike it's predecessor, the Alec Bradley Prensado, which was overrated in my opinion, the Flor de las Antillas is very much deserving of the high praise and ratings it has received. I highly recommend this cigar!